CORBA to be inducted into the Mountain Bike Hall of Fame! I’d Like to Thank… When I learned that CORBA would be inducted into the Mountain Bike Hall of Fame, my first reaction was, “where do we begin to start thanking people?” If you go back to the inception of CORBA, it all started with a 1987 Santa Monica Mountains Conservancy (SMMC) meeting where one of the agenda items was to consider adopting California State Parks’ policy of single track trails being closed to bicycles. So I guess you could say that CORBA owes a debt of gratitude to the SMMC for considering closing trails to bikes. 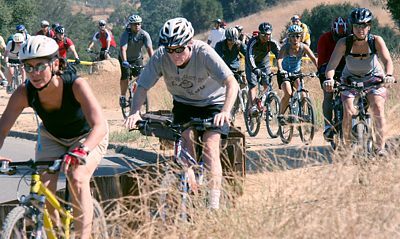 Twenty-six years later, we are still having to address issues of whether or not bicycles can coexist on public open space trails, mostly on State Parks’ trails. It’s like when snowboarding became popular at ski resorts. There was a lot of animosity leveled at snowboarders by skiers. A partial solution was to create separate areas where snowboarders could do their thing and skiers knew to stay away from those areas. But with public open space trails, we don’t necessarily have that luxury. If we want to share the trails, we have to behave accordingly and expect that there may be hikers, equestrians, and other (less experienced) cyclists on those trails. The sport of mountain biking is evolving much like the sport of skiing has evolved to include snowboard riders. Separate areas are being developed to accommodate “gravity” mountain biking, and CORBA is working with land managers in our region to develop mountain bike parks that allow for more aggressive riding, including jumps, drops, and technical features. We will be announcing some very exciting news within the next few months regarding these new areas! If you want something to last, you have to be willing to commit to the long haul. I’m not sure if that’s what the founders of CORBA set out to do, but thanks to them and everyone who got involved from then until now, we have a lasting legacy and solid foundation that will serve the next generation of mountain bikers in the greater Los Angeles and Eastern Ventura Counties. And when we accept the award on behalf of CORBA for being inducted into the Mountain Bike Hall of Fame, you can be sure that everyone on that stage will be feeling the pride of all of those who have supported CORBA over the last 26 years. 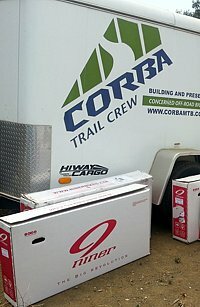 CORBA recently received a generous donation of framekits from Niner Bikes. Some of these sweet Niner frames will be put into CORBA’s Youth Adventures fleet, where at-risk youth are given the opportunity to experience the joy of cycling on trails in our State Parks. Others will be raffled off to reward volunteers who come out for CORBA’s trailwork days, or to raise funds to support our programs. 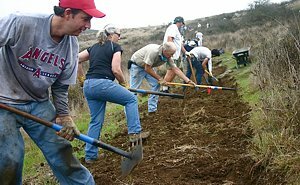 The generous donation will also benefit our neighboring IMBA Chapters, including the Santa Barbara Mountain Bike Trail Volunteers, Mount Wilson Bicycling Association, SHARE Mountain Bike Club and the San Diego Mountain Bike Association. Niner has a strong history of supporting mountain biking advocacy. They truly understand that more trail opportunities helps grow the sport, and everyone benefits. As an Above and Beyond IMBA Corporate Member their custom IMBA-themed bikes have generated many thousands of dollars for IMBA at the national level. For many years they have also been there to support CORBA’s efforts at the local level. They also understand mountain bikes themselves, making some of the sweetest mountain bikes available. Niner were among the original proponents of 29 inch wheels, and have helped advance the state-of-the-art in off-road bicycle design. We thank Niner for their generous and ongoing support, which will ultimately benefit trails and mountain bikers throughout Southern California. 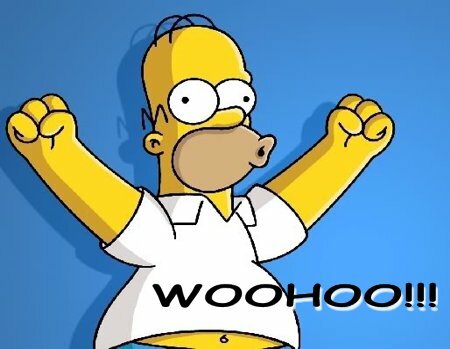 We generally don't do trailwork in July and August because of the temperature, and we haven't scheduled any for the cooler fall months yet. Dorothy Twitchell, the events director of NPBS greeted us with our own clinic space, a valet for our bikes and breakfast goodies! Shane, the GM held the clinic while Dorothy and Ben were there to help in any way they could. The clinic’s focus was to simulate things that can happen on the trail and repair them enough so we don’t have to walk our bikes out of the trail. The clinic started out with a pre ride check list that was very thorough and led us to MANY other things. We discussed the most important things to put in our packs, how to repair a broken chain, re thread the chain, what to do when a spoke brakes, rim is bent, suspension set up and more. Saturday August 3rd is the next skills clinic.